Yu Zhou Chang Wan - "Song from fishing boat during sunset"
The music describes the scenery of rivers and lakes bathed in a sunset glow while the fishermen on a home-bound boat enjoy the moving picture of a scenic landscape along the waterway. The entire piece consists of three sections: the first is characterized by a slow, melodious song expressing innermost feelings of appreciation of the scenery. In the second section, the music speeds up and vividly displays the happy mood of fishermen on the home-bound boat after the hardships of daily work. In the final section, the allegro, the melody carries on, utilizing a succession of sounds with variable techniques, vividly portraying rowing sounds, swinging motion and the spray of splashing water. Along with the music’s development, the tempo gradually speeds up; the intensity is strengthened, unfolding a warm scene of the fishing boat approaching the bank. As the boat grounds ashore after the high tide, the last notes slowly flow out, ending suddenly on an unexpected note, evoking a mood of reflection. Samples: exempted from Liu Fang's guzheng solo album entitled "Emerging Lotus". 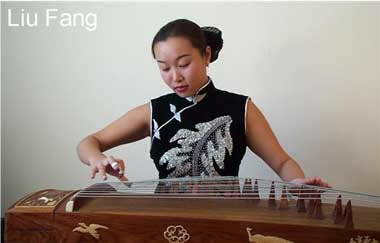 Traditional Chinese Guzheng Music . Copyright 2000-2003 Philmultic Management & Productions Inc.